What’s the advantage of using known copy number standards over relative quantification? ● Standards provide useful information about the number of copies in a reaction; comparative (relative) quantification (measured by determining Cq differences and calculating fold-changes) does not. A two-fold change could mean from 10 to 20 copies, or 100,000 to 200,000 copies. 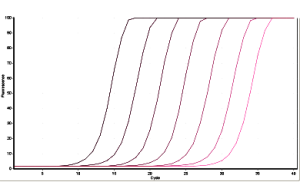 The variability of qPCR is far greater at low copy numbers (e.g. 10-100 copies) than at high copy numbers. Even giving Cq values in relative quantification says little about actual levels, because Cq depends on the hardware sensitivity, assay efficiency and amplicon length. Giving the measured copy number (i.e. the number of molecules) is direct, simple and transparent. ● Using standards gives a simple way of directly checking the efficiency of your assay from the regression line of Cq vs. log standard concentration (Eff = 10-1/slope). In our experience, efficiency determinations are low and variable when calculated from individual amplification curves by comparative/relative analysis software on qPCR instruments leading to errors in quantification. ● Standards permit exact quantification of any contamination in the negative controls. 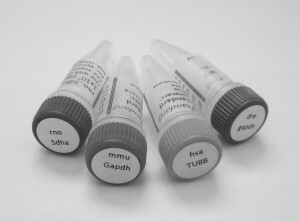 No amplicon in no-template controls (NTC) or RT minus samples is ideal, but in practice it is difficult even for experienced qPCR users to always avoid all contamination from amplicon generated in previous runs. Using standards to measure such contamination allows you to make a sensible judgement on the significance of the contamination; a few copies in the NTC but many thousands in experimental samples may reasonably be considered unimportant. ● Standards act as positive controls, and can be used as inter-run calibrators if all samples cannot be measured in a single qPCR run. Also, if another lab is using the same standard, results between the two labs can more readily be compared.